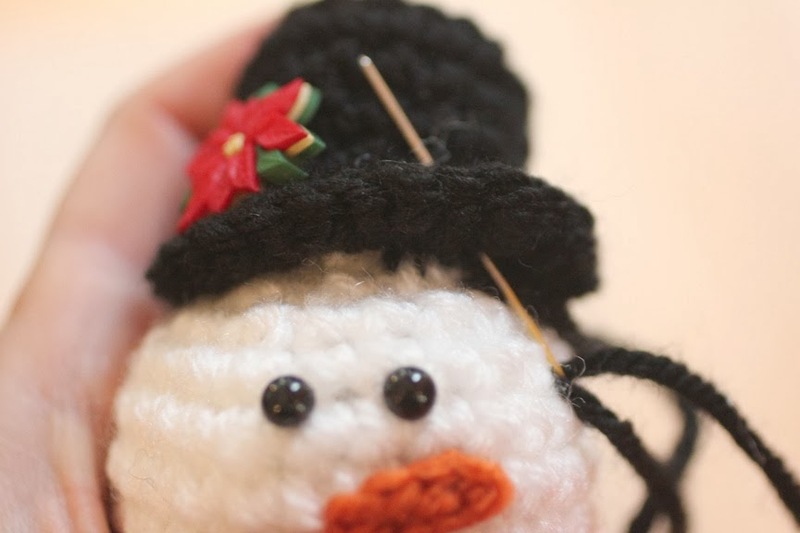 Your holiday decorating won’t be complete without this cozy crochet snowman amigurumi! I’m envisioning a whole family of them sitting on my mantel 🙂 They would also make a wonderful handmade gift for kids and adults! -Worsted weight yarn in white, black, and red. I used Lion Brand Vanna’s Choice. *Although you could stuff the entire snowman with regular poly-fil stuffing, I recommend weighting the bottom of it with Poly-Pellets so your snowman will easily stand upright. Poly-Pellets are small plastic beads. You can find them at craft stores like Michaels and Jo-Anns or you can buy them online at Amazon. Do not try to replace poly-fil pellets with rice or beans. 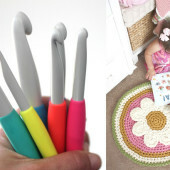 They will invite little pests into your crochet and if they get wet they can breakdown and mold. Also, you probably don’t want to put your poly-pellets directly inside the crocheted piece. Overtime the yarn could stretch and the pellets could fall out. Not safe for young children. I put my pellets inside an old pair of baby stockings. I just cut the foot off, poured the pellets in (enough to make a nice ball at the bottom of the snowman) and tied it off. Finished snowman measure approx. 6″ tall (from hat to bottom) and 3″ at its widest point. Magic ring, chain 1 and make 10 SC inside ring, pull tight and continue to SC in rounds (do not join). 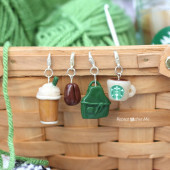 Use a stitch marker to keep track of your rows if needed. Chain 4, slip stitch in 2nd chain from hook, slip stitch in next chain, SC in last. Fasten off, sew onto head. Chain 50, SC in 3rd chain from hook and rest of the way down chain. Fasten off weave in ends. Tie around snowman neck. Rd 8: 2 SC in each stitch around, join, fasten off leaving tail to sew on to head. Add a cute button like a poinsettia. Stuff hat lightly with poly-fil stuffing before sewing onto head. 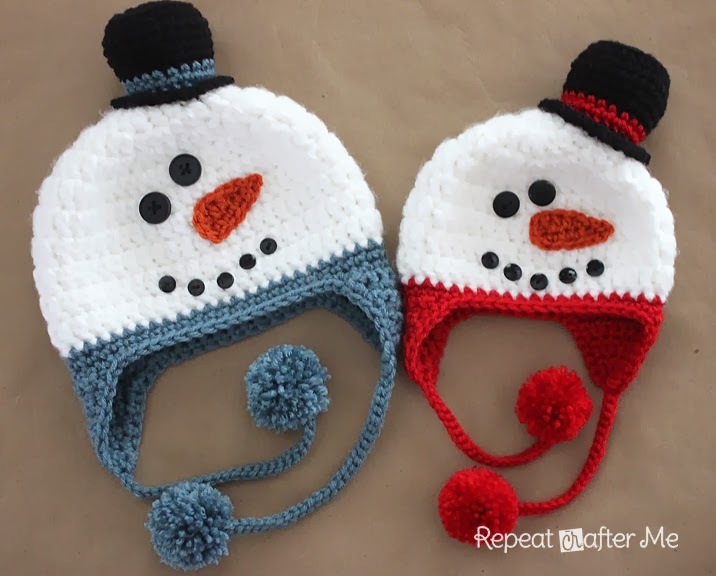 FREE Snowman Hat Pattern and my Snowman Appliqué! So cute! I`m definitely going to make a family of snowmen, for my family. 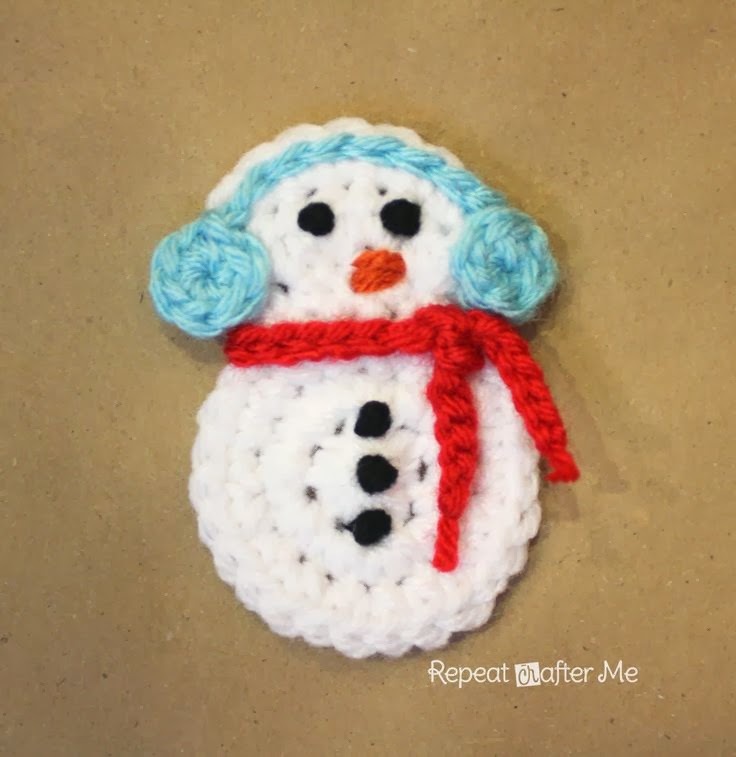 🙂 Do you use the safety eyes, for the snowman`s buttons? 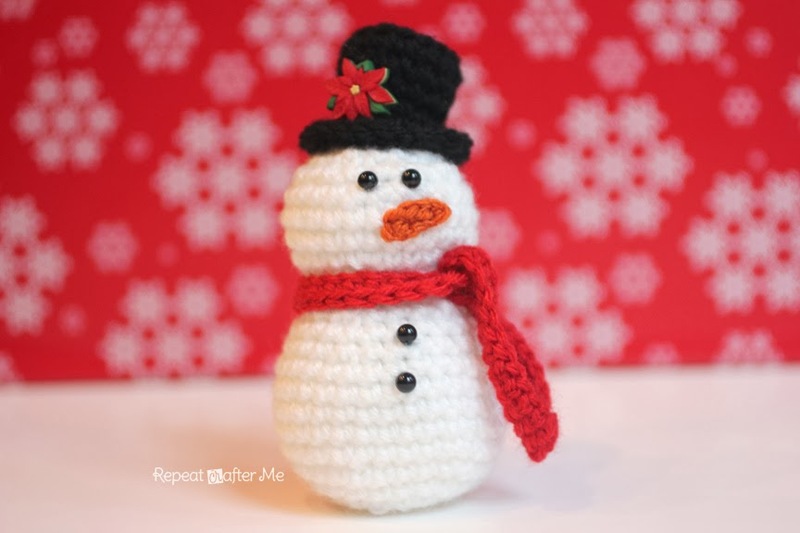 Gorgeous little snowman. I'll put him on my to-do-list for Christmas/winter. Thank you. Adoro i pupazzi di neve, grazie per lo schema! How adorable! I love this little guy! I LOVE the smart you showed me using a nylon to hold the beanies. This can be used in everything and anything you use theses in. SMART!!! I really enjoy the cute patterns you share with us. I make so many for my grand daughter, poor kid wont have any hair. lol Plus your children are so adorable. I love watching kids grow up, its fun to see the changes in them as they grow up from baby to child to teen to wow how did they get that old. ha ha ha. Thanks so much for all you do. Hugs! Hi Sarah! I just discovered your blog a couple of days ago. I am so impressed with your talents. I love all your patterns!!! I just wanted to thank you for sharing your wonderful talents. 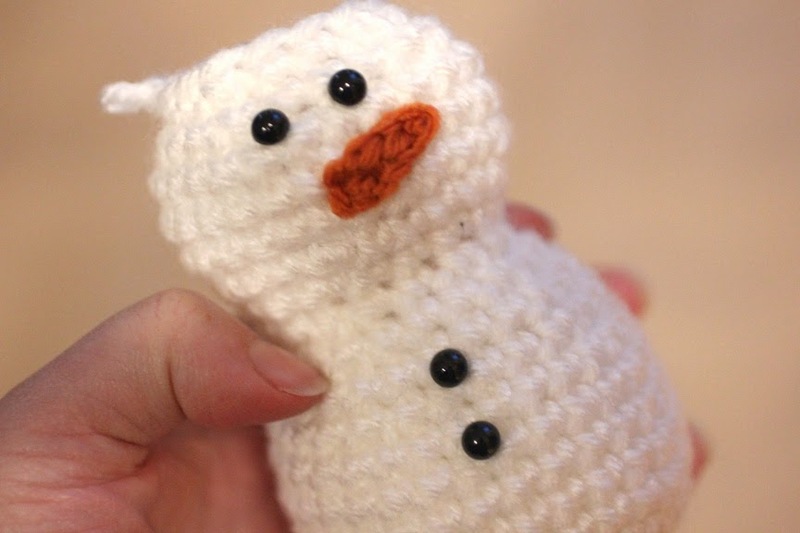 I decide to start off with the snowman since its been awhile since I crocheted. I am on the 23rd row ready to stuff but I only have one ball, not two. I don't see any directions for the rest of the body beside the nose, hat, and scarf. Am I missing something? Appreciate any help you could give me. Thank you in advance. Boy, am I rusty!!! I got it. I really messed up the first time. It looks adorable!! Thank you so much!!! So cute Sarah! You amaze me! I am going to try and make these a little smaller to embellish a package with. SO adorable! Hi Sarah! I am so glad that I recently found your wonderful blog on Facebook! Your talent inspires me to give crocheting a try once again. I learned how to knit first and am still learning how to knit better. 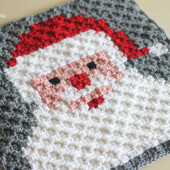 I want to crochet as well but I find it difficult to remember all of the various crochet stitches. I have trouble finding the correct spot to insert the crochet needle so my confidence level is not where I would like it to be. Today, I saw your FB post where you showed an excellent diagram pointing out exactly where to insert the needles for various sts. I love that you did this for her!!! I wish that you had a booklet showing diagrams like in your FB post. Thank you for being so talented and for sharing your talents with us! I can't wait to make the Snowman! So cute! I work for a public library and teach a beginner crochet class. I am always looking for new and fun patterns for the participants. 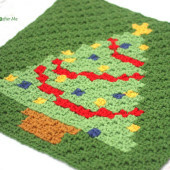 Would I be able to give them a copy of your pattern and show them how to crochet it? We are a non-profit organization. Thanks for your consideration. I HAVE BEEN LOOKING FOR A SNOWMAN!!! THANK YOU THANK YOU THANK YOU SO MUCH FOR SHARING!!!!! 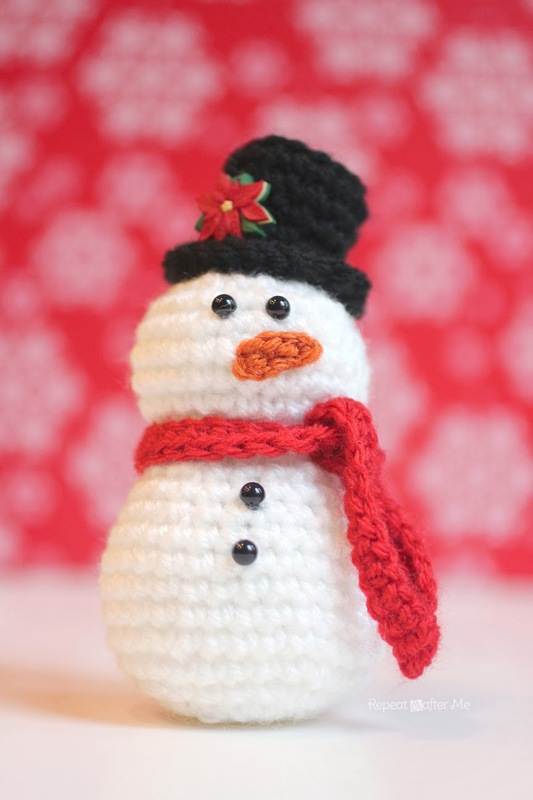 The snow man has come out so well, perfect for a small secret Santa gift for a co worker. Thank you for an awesome pattern. Please don’t use plastic. Glass will work and won”t pollute our wildlife and oceans. 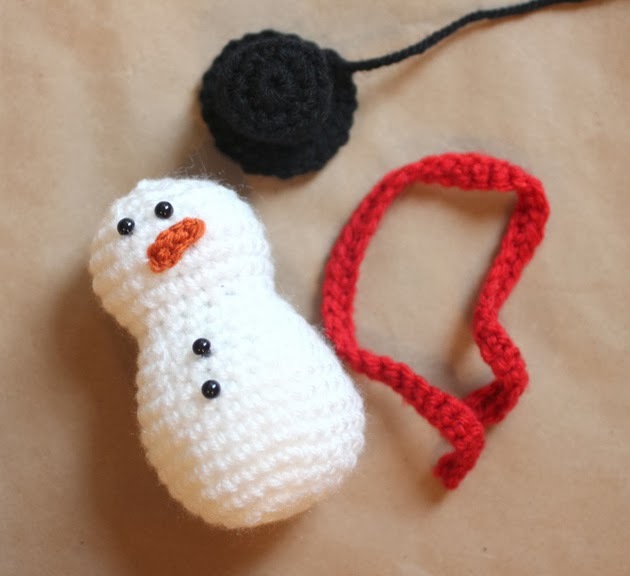 I want to learn to crochet a snowman , I got where I like snowman better than Santa.